In a bowl, combine ground Graham cracker crumbs and melted butter. Press into mini tart pans and place in freezer to harden, for about 20 minutes. Remove crust from tart pans and place on a plate and return to freezer until ready to fill. Stir together yogurt, softened whipped topping and orange juice until smooth. Fill mini tarts with filling, top with chocolate chips, fruit or sprinkles and return to freezer until ready to serve. Try using chocolate wafer cookies instead of Graham crackers. Dress up your yogurt with vanilla extract or even coconut extract. 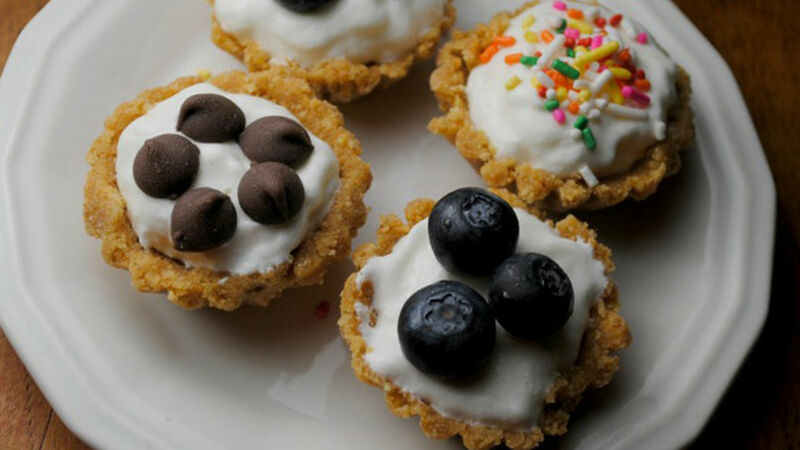 These luscious mini tarts will brighten your day and simply make you smile. They are no-bake tarts and that makes them even more lovable. Creamy yogurt and whipped topping is all you need to make the filling, plus a dash of orange juice. Top them with whatever your little heart desires and enjoy!